Falkville, AL – A Sand and Gravel operation in Phoenix, Arizona had experienced chute buildup, along with plugging due to heavy clay content in the material. Safety issues were cited because the chute had to be manually cleaned by plant operators on every shift. Confined spaces and a lack of space to maneuver added complexity to the situation. These problems required downtime during production hours which impeded plant availability. 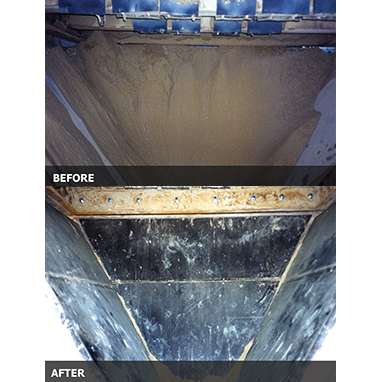 The Before and After photos are an example of a chute that was once backed up by sticky material buildup but then became clear and functional after Valley Rubber’s Inflatable Liners were installed. Valley Rubber designed a custom manufactured Inflatable Liner package to fit the application. The rubber compounds involved played a major role in the cost-effective performance of the liners and offered protection against impact, cuts, tears and abrasion. This system dramatically reduced the buildup of sticky material. The Inflatable Liner system came with a control box that supplied minimal plant air to the liners. These control boxes can be modified to have the following features: additional air outlets, lighting, heating, outside controls, operating indicators, remote controls and more. Safety had been a major concern with the operation’s previous chute design, but with the addition of Valley Rubber’s automated Inflatable Liners system, it was no longer an issue. This is because these liners eliminated the need for chute maintenance in troublesome areas. The reduction in noise was an additional benefit of the liner that was not initially anticipated. Due to the computerized nature of the system, downtime during production runs was reduced to zero. Originally installed in 2007, the first liners are just now wearing out…eleven years later!